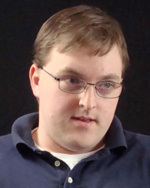 Michael Becker joined the Chronicle in 2005 and became web editor in 2009. In addition to his work for the paper, he has taught writing to college freshman, edited doctoral dissertations, written for magazines and worked as a science reporter. His interest in online journalism grew out of a fascination with blogs and hypertext in the early 2000s and out of the certainty that Web technology could be used to tell important stories in interesting ways. Becker is a graduate of Montana State University with a master’s degree in English. He lives in Bozeman with his partner, Susan, taking care of his two sons and a few dozen blogs and websites.